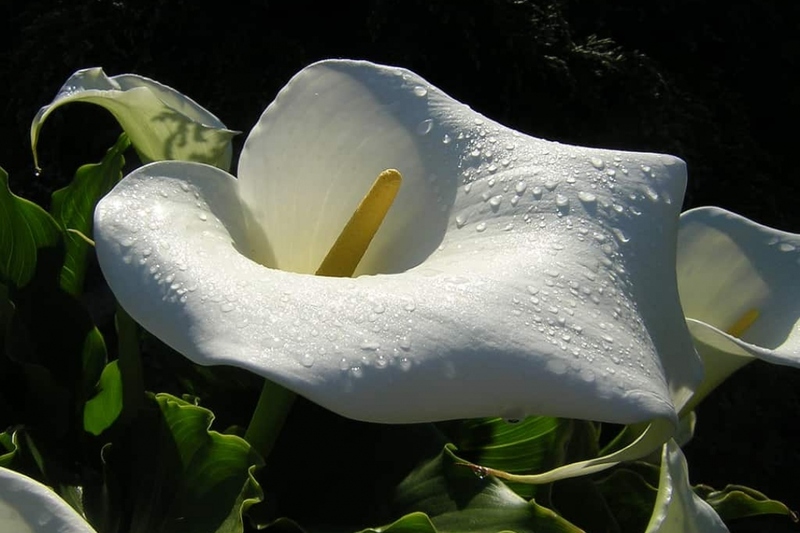 Ethiopia Arum (Zantedeschia aethiopica): growing, planting, caring. A perennial cousin of the Arum and native to African swampy areas, the Arum of Ethiopia fears frost and grows well in the water. Ethiopia arum is a perennial plant with rhizomes whose large decorative leaves - sometimes spotted - are persistent. It forms inflorescences protected by a large white spathe. The Ethiopian arum, originally from South Africa - contrary to what its name suggests - is considered a poisonous invasive plant in many countries. In our regions it fears the cold in winter. Wait for the temperatures to be mild: a warm ground is a guarantee of good development! Plant your arums of Ethiopia in a basin to protect them in winter in mild climate. In a harsh climate, plant in a 20-liter pot or a basket filled with rich, rather clayey soil, and place it in water, submerged up to 30 cm. You can take it out to shelter it during the winter. When the heavy frosts are over, reinstall your Ethiopian arums in the pond, up to 30 cm deep. If you are in a harsh climate, take out the baskets containing your arums and shelter them from frost. Water your potted arum regularly, but not excessively - do not wet the foliage, and do not fill the cup.